What a difference a mere week makes! The temperature felt like it had stepped back to the March’s and I ended up donning my oversized Uniqlo fleece jacket all last week. To make the matter worse, the work on my walk-in shower room ran on much longer and while the builders were working in there, they preferred to have the space well ventilated. Therefore, the French doors had to be kept wide-open despite plunging temperature and infrequent rain which left my flat very draughty. Time to time, there was a moment I just hated all the noise, the smell and the dust. Especially the dust, it went everywhere. I wouldn’t know how I could have dealt with them if I didn’t have well supplied Pledge’s Fluffy Dusters. Anyway, the end is in sight at last. Once a broken macerator is replaced tomorrow morning, my brand new shower room will be up and running. And the first person to enjoy it will be Mr.B. He might not welcome it but the matter is very urgent because his coat has lost its lustre for quite sometime. Hubbie had been snowed under with designing e-book for a poet this weekend. ‘Sorry for being holed up’, he apologised. Oh well, how could I get annoyed with him since he was earning the dough. 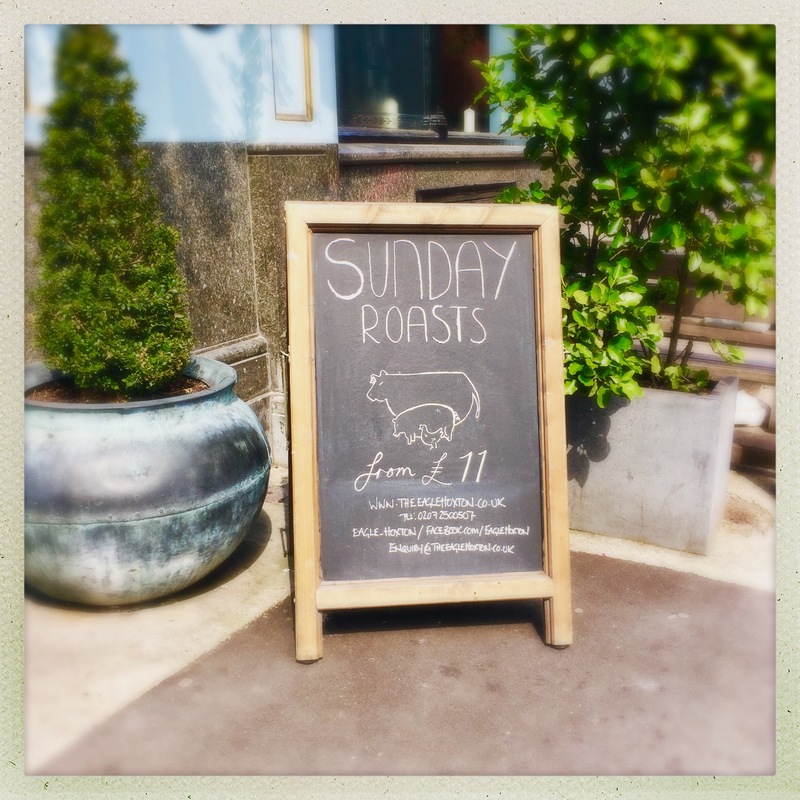 So I suggested Sunday roast at our pub. The idea cheered him up greatly and once the clock hit 2 o’clock, we headed to our local pub. The first pub, William IV, we tried didn’t have Sunday roast. ‘Sorry guys. Our chef left recently and we haven’t found a replacement yet’. What a shame. So we walked to another pub at the opposite end of the street. There are a few pubs named “The Eagle” in London. However, this is the only pub whose name is included in a nursery rhyme: Up and down the City road, in and out The Eagle. That’s the way the money goes. 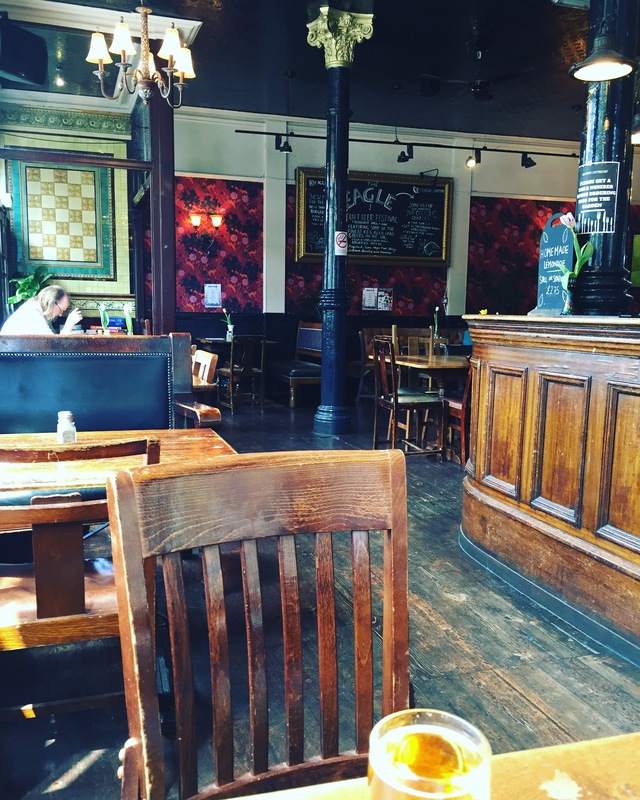 Pop goes the weasel… The actual pub stands next to Shoreditch Police Station and therefore here must be a waterhole for local bobbies too? Behold my roast Shropshire half chicken, gingerbread stuffing and chicken gravy! Hubbie had roast pork loin with red wine jus. 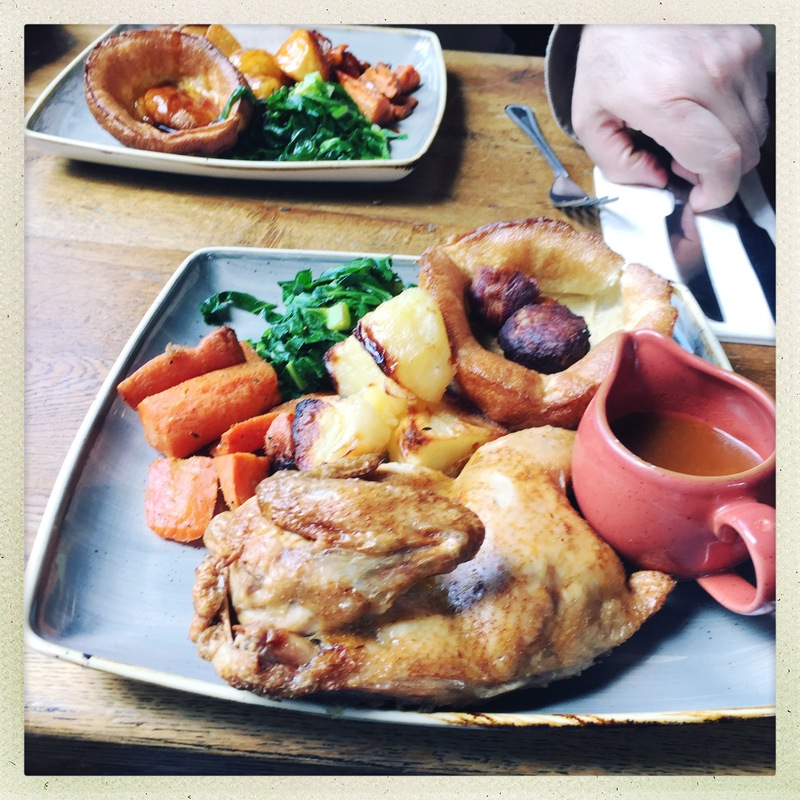 Both dishes were accompanied by Yorkshire puddings, roast potatoes and cooked greens. The chicken was very moist and tender. The stuffing was tasty and the vegs were done perfectly. It was 10/10. Whoa! Half a chicken. Nice! Love how you get your own jug of gravy. I love gravy. I secret make roast dinners just so I can have gravy.